O Bethlehem, receive Christ, for He comes to dwell in you in the flesh, that He may open Paradise for me. Make ready, O Cave, to behold the One who cannot be contained, now wonderously contained in you; for He now is made poor in the wealth of His tender mercies. In the prayers of the Byzantine Catholic Church leading up to the Nativity of Our Lord and during the celebration of this great feast, the paradoxes of our faith are continually placed before us: "Behold Him who is invisible is now visibly manifest," "As a stranger You have come to Your own," "How shall I nurse the One who gives nourishment to the world? 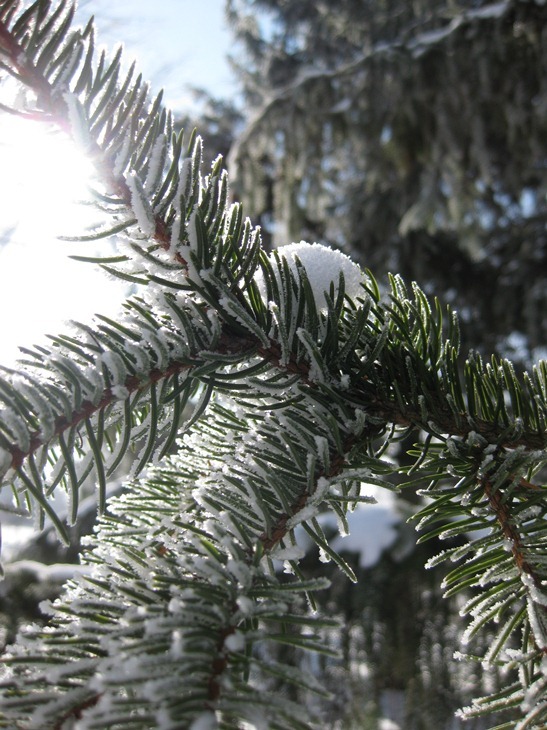 ", "How shall I wrap You in swaddling clothes, for You wrap the whole earth with clouds? ", "I hold in my arms as a child the One who upholds all," "Behold! The Image of the Father and His unchangeable eternity has taken the form of a servant." Just now as I was writing this blog post, a friend encouraged me to read Pope Benedict's Christmas Eve homily (without knowing what I was writing about). It seems that the Holy Father was reflecting on the same thing! Today, anyone wishing to enter the Church of Jesus' Nativity in Bethlehem will find that the doorway five and a half meters high, through which emperors and caliphs used to enter the building, is now largely walled up. Only a low opening of one and a half meters has remained. The intention was probably to provide the church with better protection from attack, but above all to prevent people from entering God's house on horseback. Anyone wishing to enter the place of Jesus' birth has to bend down. It seems to me that a deeper truth is revealed here, which should touch our hearts on this holy night: if we want to find the God who appeared as a child, then we must dismount from the high horse of our "enlightened" reason. We must set aside our false certainties, our intellectual pride, which prevents us from recognizing God's closeness.... Let us allow ourselves to be made simple by the God who reveals himself to the simple of heart. It's just my size! Is it for me??? Well, Christmas at the monastery was beautiful! We were so blessed that Fr. Stephen Titko was available and happy to come out to the monastery to celebrate the liturgical services for us on Christmas Eve and Christmas Day. We found our deepest joy in receiving Christ in the Eucharist, our humble God for whose coming we had been preparing our hearts. We also cooked the traditional Christmas Eve Velija supper and enjoyed it with some friends. We hope that you are enjoying the celebration of this beautiful feast! S'nami Boh! God is with us! ..."Somebody please buy those nuns a taller ladder!" We are continuing with the preparations for the Nativity of Our Lord, which include not only baking, cleaning and preparation for liturgical services, but also, and most importantly, the transformation of our hearts so that we will have a place to receive Him. May you all have a blessed, grace-filled Christmas! The nuns of Christ the Bridegroom Community would like to wish a big CONGRATULATIONS to Sr. Celeste who made her life profession as a stavrophore nun and is now Mother Theodora! Mother Theodora is named for Blessed Theodore Romzha, a Byzantine Catholic bishop marytred for the faith in 1947. In God's providence, this year was named 'The year of Blessed Theodore Romzha' by the Eparchy of Mukachevo. 2011 marks the 10th anniversary of Blessed Theodore's beatification, the 75th anniversary of his ordination to the priesthood, and the 100th anniversary of his birth. One account of the life of Blessed Theodore. Here is a link to the wonderful photos taken by Denis Kucharski! God grant you many years, Mother Theodora! 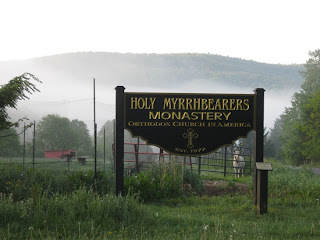 Life is a mystery, and it was providential that Holy Myrrhbearers Monastery in Otego, New York, graciously tended to the needs of Christ the Bridegroom Community. 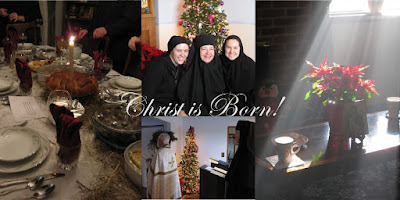 The Myrrhbearers mentioned in the Gospels tended to the needs of Christ from their personal means (Luke 8:2-4), and the nuns of Holy Myrrhbearers Monastery opened their home and hearts and shared their personal means with us. The Myrrhbearers in the Gospels displayed unyielding courage and were not intimidated by any animosity and fear that permeated the atmosphere. With love, they forged forward to approach the tomb of Christ. The nuns of Holy Myrrbearers emulated this courage with the myrrh of love and conviction. Knowing that they could possibly incur some criticism by hosting us, they still forged forward with love and conviction and allowed us to experience a deeper life of Eastern Christian monasticism. There was an immediate bond between the two communities, and through all the prayer, hard work and oneness of heart that developed between us, each monastery was a gift to the other. At the end of our stay, bittersweet farewells were exchanged with tears and embracing, with both communities knowing they were strengthened in their faith and commitment to Eastern monasticism. The nuns of Christ the Bridegroom Community will always be grateful to the nuns of Holy Myrrhbearers Monastery and we look forward to an ever deepening relationship, to be of one heart and one spirit (Acts 4:32). Though ecumenism between the Catholic and Orthodox Churches remains in dialogue, there is still much to be undertaken for spiritual understanding and unity, and we hope that the bond that grew between us is one more small step towards this goal. We pray that one day we will be one (John 10:17). 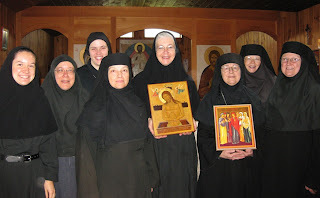 Our typikon confirms this commitment: The nuns of this monastery will pray with their whole beings for the unity of all Christians, “So that they may be One as I and My Father are One” (Jn 17:12). They will pray especially for understanding and reconciliation between the Eastern and Western Churches. The role of monasteries as meeting places for the East and West was emphasized by Blessed John Paul II: “In this regard, I hope that monasteries will make a particular effort, precisely because of the unique role played by monastic life within the Churches and because of the many unifying aspects of the monastic experience, and therefore of spiritual awareness, in the East and in the West” (Orientale Lumen 25). During our time in New York, the word “vigilance” continually resurfaced in my prayer. Maybe it was because of the goats? 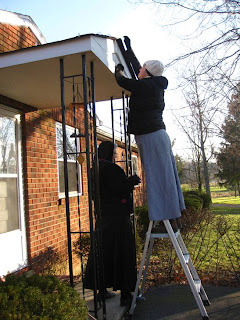 But I learned that vigilance is more than simply persevering in my daily chores (or “obediences”) and even more than showing up for each of the many monastic prayer services throughout the day. Vigilance is being constantly aware of the presence of Christ and allowing myself to be absorbed in that presence. Doing my chores with Jesus filled me with peace. I experienced a great freedom in carrying out the tasks given to me, especially the physical work. Away from the demands of founding a new monastery, I could simply be a “child”—a novice—and learn how to pray! I am grateful to the nuns for welcoming us into their home for three months, and I am grateful to God that I have new sisters in New York! Poverty. Chastity. Obedience. Of the three monastic virtues, I feel like obedience is that last thought about by people outside of a monastery and the most thought about by the nuns in a monastery. I would say that obedience is the most important virtue, out of which the other two virtues flow. 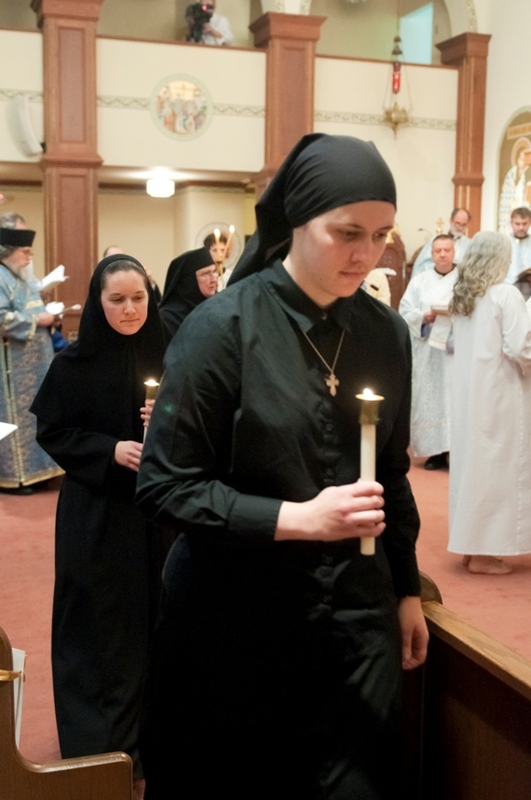 In order for a nun to truly live out poverty and chastity, she must first obey the call of her Beloved, who is made visible through the mother of her community, so that she may die to her own desires and become totally fulfilled by her Beloved. During our time in New York, obedience was a recurring theme for my prayer. 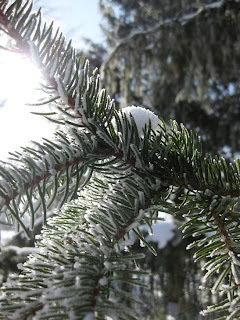 In particular, I felt an overwhelming sense of the need to embrace obedience with JOY. I had a great desire to not only complete the tasks I had been assigned, but to do each task JOYFULLY, as if I were doing each task for my Beloved. For a city girl like me, this desire often challenged me, especially when it came to shoveling poop in the goat barn! But there was such a freedom that came with embracing even the humblest of tasks and doing them totally for Jesus. This freedom came from abandoning my own will and accepting Jesus’ will in everything, trusting that He would give me whatever I needed to do what He asked. 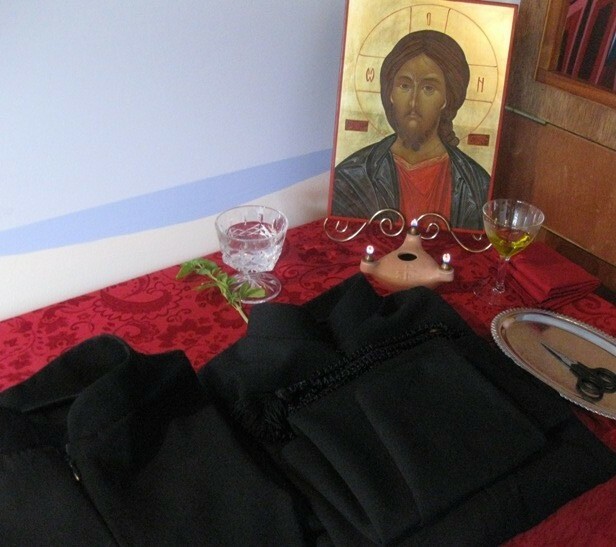 "Obedience is not blind, but deliberately seeks to know God's love and to experience the liberation of freely and continually falling into the arms of the Bridegroom with increasing trust" (Monastic Typikon, Christ the Bridegroom Monastery). Then the disciples of John came to Him, saying, “Why do we and the Pharisees fast often, but Your disciples do not fast?” And Jesus said to them, “Can the friends of the bridegroom mourn as long as the bridegroom is with them? But the days will come when the bridegroom will be taken away from them, and then they will fast (Mt 9:14-15). We Christians are not yet totally united with the Bridegroom, Jesus, so we fast. We fast, in one sense, as an expression of the hungering of our souls for union with Him. Even we ourselves groan within ourselves, eagerly waiting for the adoption, the redemption of our bodies (Rom 8:23). Fasting should stir up this groan—this longing—for heaven; not just a heaven of “eternal rest,” but for the eternal explosion of joy that is union with the God of infinite love. The Church invites us to fast for forty days before the Nativity of Our Lord. This period of time, beginning on November 15 each year, is called the Nativity Fast, or the “Philip’s Fast” (because it begins after vespers on the feast of the Apostle Philip). During these forty days, we fast because we are waiting for Christ’s coming—liturgically, in anticipation of our yearly celebration of His Nativity, and literally, in anticipation of His second coming. The Nativity is the beginning of God’s union with mankind. At that very specific point in time, the creator of the universe united Himself with human flesh. The One who had always been, became man! “And man is not left alone to attempt, in a thousand often frustrated ways, an impossible ascent to heaven…The Word became flesh, like us in everything except sin. He pours divinity into the sick heart of humanity, and imbuing it with the Father’s Spirit enables it to become God through grace” (Blessed John Paul II, Orientale Lumen, 15). Fasting shouldn’t be gloomy. We are preparing in joyful anticipation for the Wedding Banquet of heaven! We shouldn’t judge those who use feasting as their way to anticipate the celebration of the Nativity (perhaps God is using this type of joy to lead them to Him), but we shouldn’t be afraid to share with them the concept of fasting as a way of preparing for this feast. Let’s try to share the indescribable joy we experience in celebrating the Nativity after a season of fasting. And if we haven’t experience this joy, let’s fast more intensely, laying ourselves aside and surrendering our will and our desires so that we can welcome the God of the universe into the humble manger of our hearts. He wants to unite Himself to us. 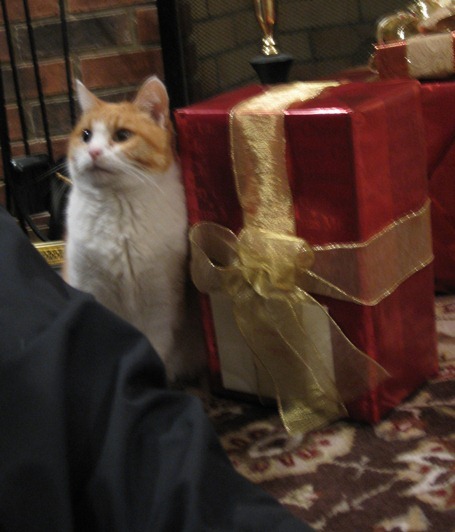 He wants us to be ready for the Wedding Feast! We wanted to let you know why you won’t be hearing from us too much (if at all) for the next three months. 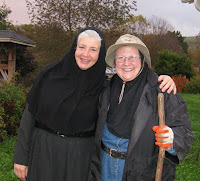 We are heading out to Otego, New York, for a stay with the nuns of Holy Myrrhbearers Orthodox Monastery. 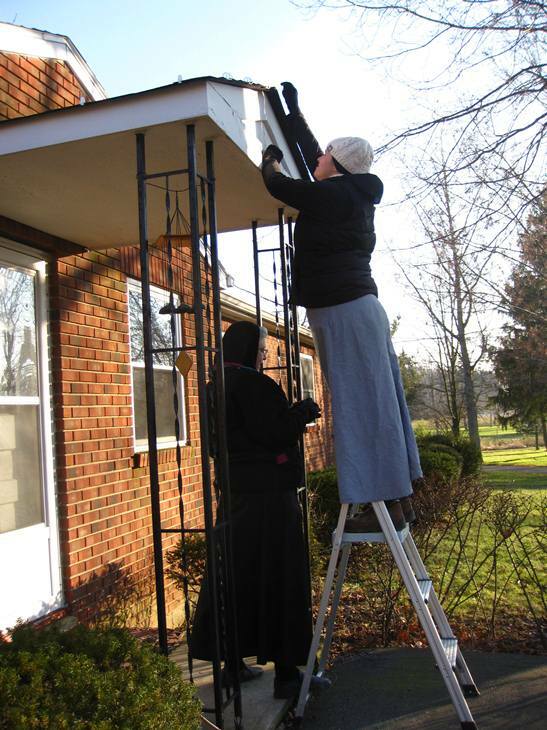 This experience will be a time of preparation for Sr. Celeste as she prepares for her life profession on November 20th of this year, and it will also be an opportunity for all three of us to learn from an established Eastern monastery. We are grateful to the nuns for enthusiastically welcoming us into their home and community life for these three months! We are also grateful to those who have offered to work on projects around the monastery and grounds throughout this time that we are gone. We know that the monastery is in good hands! We are sad that we will not be able to be present to the pilgrims at the annual eparchial pilgrimage at the Shrine of Our Lady of Mariapoch (Aug. 13-14) right across the street from the monastery, but God has chosen this time for us to spend with Him and to learn more about the monastic life. He is asking us to trust Him in an even deeper way—to let go and trust that He is taking care of everything. We hope that this time will help us to become better nuns so that when we return we will be better able to love you, to be a witness to you and to uphold the Church in prayer. As we leave, we are carrying all of you and your needs with us, even if we do not know you. We believe that this time away will help us to draw even closer to you and to the whole Church as we intensify our prayer life, draw closer to Christ and unite our daily work with your efforts and struggles. We are asking for your prayers also. We rely on the prayers of the people of the Church so that we can continue to be open to God’s will and faithful to Him, especially when difficult challenges arise. Thank you and God bless you! Holy Myrrhbearers Monastery is part of the Orthodox Church of America (OCA), and their website is www.holymyrrhbearers.com. We promised that we would share more about what we have been up to this summer, so here you are! 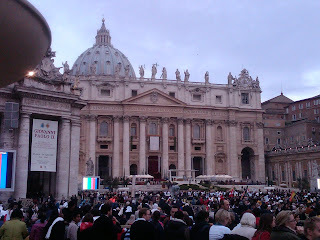 Earlier this summer (in June) we were blessed with the opportunity to take a pilgrimage (and it truly was a pilgrimage!) out West, with our destination being Las Vegas (of all places!) for the ordination of Fr. Diodoro Mendoza to the priesthood. Fr. Diodoro is a good friend of ours and it was truly worth it to make the trip, by car, all the way to Las Vegas. God provided in so many ways for us on our trip. In His providence He arranged for places for us to stay with people we didn't even know (found through mutual friends), but who will now remain our friends. He provided donations, great weather and so many memories. He placed so many beautiful people in our path, connecting us, as He loves to do, with those who would inspire us and those whose lives He wanted us to touch. The highlight of our trip was Fr. Diodoro's ordination and his first Divine Liturgy the next day, both at his home parish, Our Lady of Wisdom Byzantine Catholic Church in Las Vegas. Our Church has been gifted with an amazing priest! At Fr. 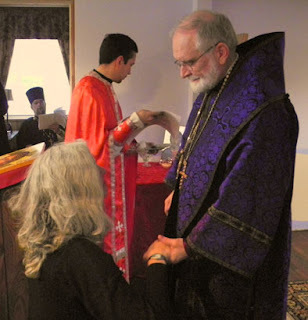 Diodoro's first Divine Liturgy it seemed to us like he had been a priest for years--his celebration of the Liturgy and preaching seemed so natural to him--he was made for this! 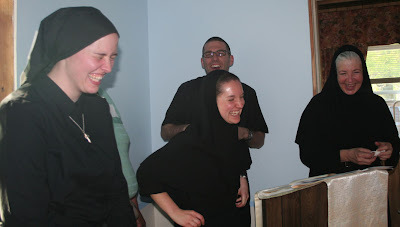 :) It was also wonderful to spend time with the seminarians and all of the people we met. On our way to Las Vegas we stopped at several National Parks, including Arches, Bryce Canyon, Zion and the Grand Canyon. These excursions were blessed opportunities to enjoy the beauty of God's creation, spend some time in quiet contemplation and speak to other visitors who were curious about our way of life. Some favorite memories include singing "O Joyful Light" at the Grand Canyon as we watched the sun set, hiking at Bryce Canyon and sitting in the silence of the desert at night at Arches National Park. On our way out and our way back we stopped at Holy Protection of the Mother of God Byzantine Church in Denver and joined the parish for Divine Liturgy. We loved meeting the parishoners and spending time with Fr. Michael O'Loughlin and his family. Our final scenic excursion was Rocky Mountain National Park with Fr. Michael, and then we headed home. On the way home we also stopped at Annunciation of the Mother of God Byzantine Church in Homer Glen, Ill., and joined the parish for vespers and Divine Liturgy for the feast of the Nativity of John the Baptist. God continued to bless us even as we returned home, introducing us to a beautiful family at the parish. We enjoyed our last night of the trip with a cookout with Fr. Tom and these parishioners. We thank all the amazing people who hosted us or supported us in various ways throughout our trip! 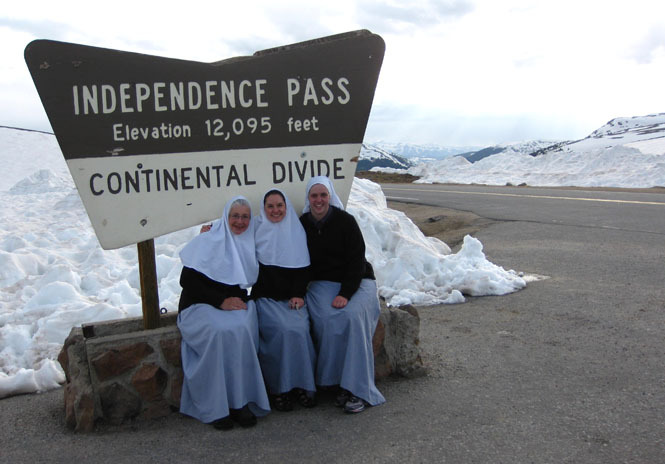 It was a much-needed and inspiring pilgrimage, and we will cherish these memories forever! Calling all teen girls! 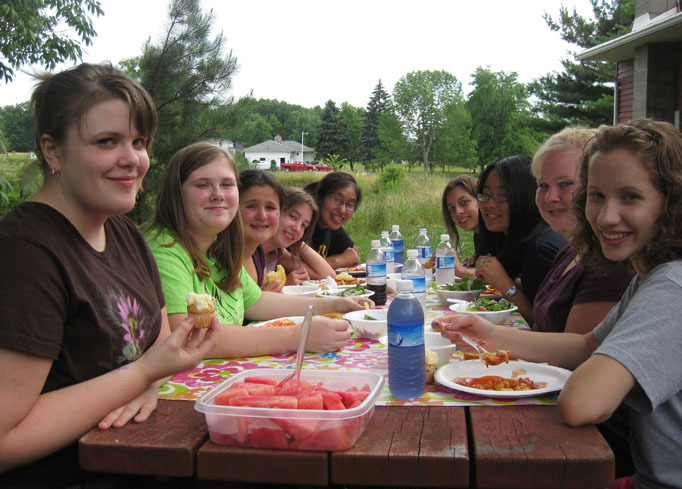 The deadline is fast approaching to register for the 3rd Annual Life in Christ Girls' Sleepover Weekend, happening July 14-17th! 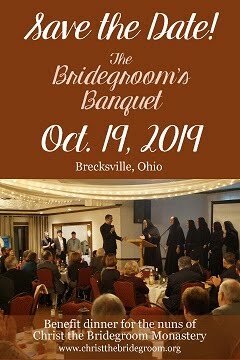 Registration is due by this Friday, July 1st, but if you are interested in coming and can’t quite make the deadline, please contact us via email at christthebridegroom@gmail.com or give us a call at 440-834-0290 and let us know you are sending in your registration ASAP! TEN WAYS YOU’LL SHOCK THE WORLD: REVEALED! 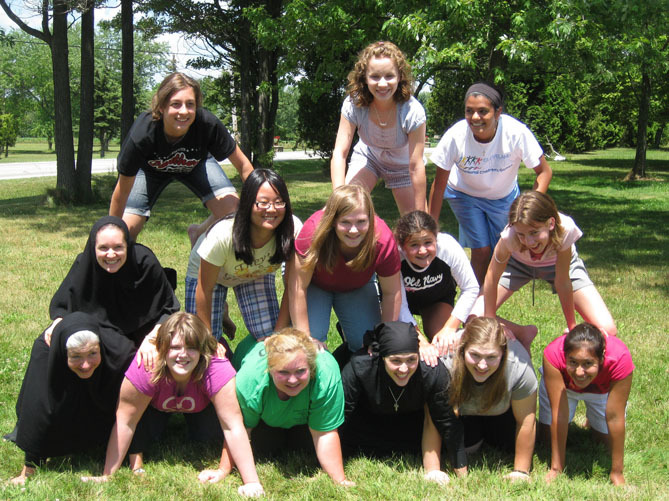 during our exciting adventure together as we learn and explore what it means to be ‘Young and Faithful.’ The weekend, open to teen girls, 13-19, is hosted by the nuns of Christ the Bridegroom Community in Burton, Ohio, and led by young adult women. Cost is $75; scholarships may be available. Registration form and information available for download at www.parma.org. Can’t wait to see YOU there! Please support our Pond Excavation and Repair Project! Having a pond on the monastery’s back property has been a joy for us and our guests. It is a peaceful place to pray and relax. We treasure the variety of life and activity that a pond’s ecosystem attracts, including fish, turtles, frogs (LOTS of frogs! ), blue heron and other aquatic birds. A few guests have even enjoyed trying their luck at catching some fish, including some very young guests who learned a lesson about the power of prayer (especially prayer to the fisherman St. Peter)! Children who visit the monastery are always attracted to the pond. During the two years that we have been here, the pond’s aging drainage system has deteriorated at a surprisingly quick rate, especially during this exceptionally wet spring. Water has seeped around the cement overflow drain and has eroded the ground most of the way around it. The water therefore no longer drains out of the pond through the pipe, but flows around the cement slab and erodes the ground. The erosion has created a deep pit that is very dangerous. The draining water flows out of the other side of the dam, down the incline and floods our property and the neighbor’s property. The grass can no longer be cut around this area of the pond because of the danger of collapsing ground. The ground along the side of the pond facing the monastery is also eroding towards the building, and we believe that the ground may be saturated and causing the settling of the foundation on that portion of the monastery. Lining of the shore with small rocks to prevent erosion. 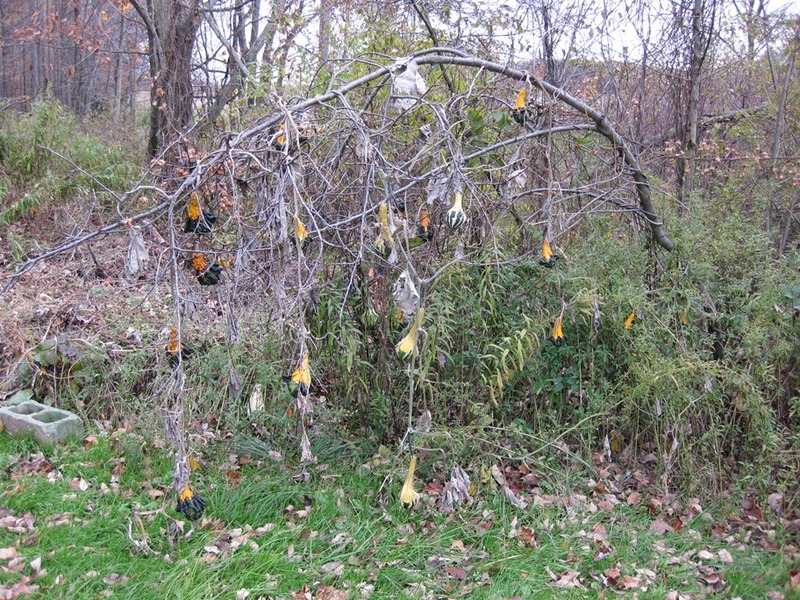 The project will cost approximately $5,000. 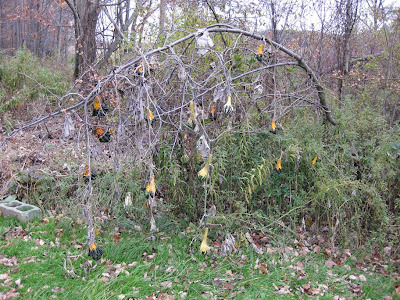 If you are financially able, we ask you to please consider making a donation toward this project. Your donation will help to ensure that the monastery grounds will continue to be a safe and enjoyable place to visit. If you have been blessed with the financial ability to make a larger donation, we would like to let you know that for donations of $500 or more we will have your name engraved on a bench that we will install near the pond after the completion of the project. Donations may be made in memory of a loved one, if you choose. 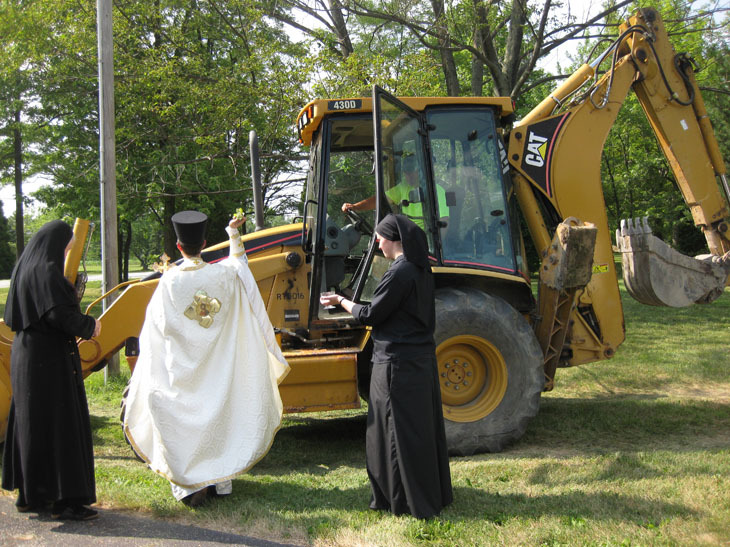 Please make checks payable to: Diocese of Parma Monastery Fund, and indicate that your donation is for the pond project. With questions, feel free to call us at 440-834-0290. 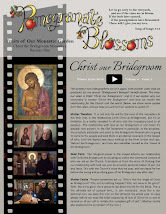 May our Bridegroom bless you abundantly for your generosity in this time of need! Forget our own people and your father’s house. These were some of the first words I heard during vespers on Sunday, May 22, a day that I will remember for the rest of my life – my entrance day. Hello, my name is Jessie Houck and I am the new postulant of Christ the Bridegroom Community! 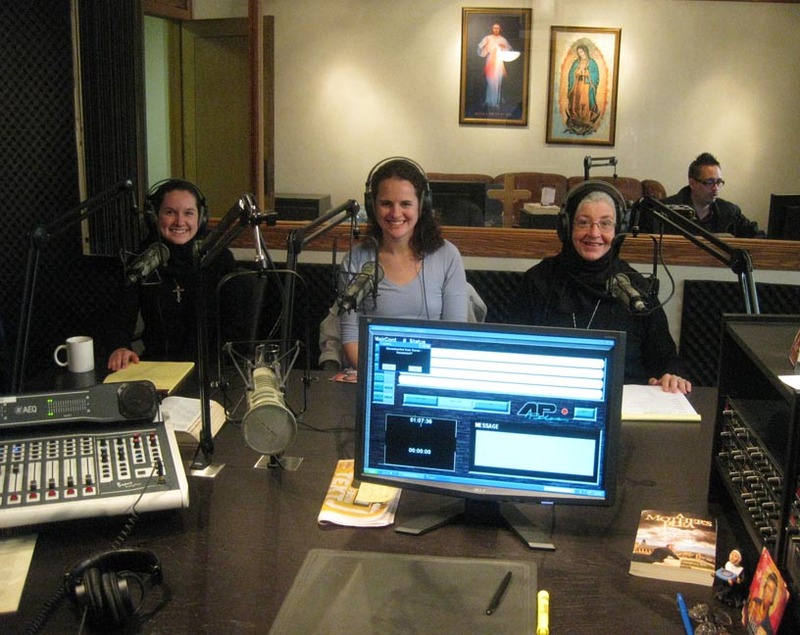 If you didn’t see Sr. Celeste’s post several weeks ago, I am from Akron, Ohio. My home parish is St. Francis de Sales. A former tax accountant turned postulant, I am the newest member of our growing community and could not be more excited to be here! Sunday was such a wonderful experience for me. I was able to attend mass for the last time at my parish, I joined my parish family for an ice cream social and then we packed up the last few items and hit the road – Burton or bust. My parents and I arrived in time to help with a few last minute preparations before vespers. We were able to spend some quality time with everyone before vespers began. God could not have planned a more beautiful afternoon. The whole vespers service I felt as though the world had slowed to a halt. The room was filled with people who care not only for me, but also for our community, so the love was almost palpable. As I knelt before Bishop John and listened to the words he prayed over me, I felt this great peace well up from within me. Sr. Julie assisted me with the official ‘scarf placement’ (good thing we practiced!) and that peace just seem to overtake my whole body. Bishop John gave a wonderful reflection on how often we think of the Holy Spirit as ‘coming upon us’ or ‘covering us’ like the scarf on my head, when rather dwells within our being and flows forth to those around us. It was a surreal experience to hear him speak those words while I felt exactly that happening to me! Since it was the Sunday of the Samaritan Woman, I felt as though I was meeting Jesus by the well – or the monastery, as the case may be – and He was seeing me just as I am. Broken. Sinful. Unworthy, but made worthy through His Death and Resurrection. Upon seeing me, Jesus didn’t want to quench my thirst with just any water, but The Living Water. And after encountering Him, I left my water vessels or possessions behind to tell everyone of The Living Water that has quenched the thirst of my soul and is now overflowing! Jessie's Pastor - Fr. David Bline, Jessie and Bishop John. Behold the Bridegroom is coming in the middle of the night. Blessed is the servant He shall find awake (Bridegroom Matins Troparion). 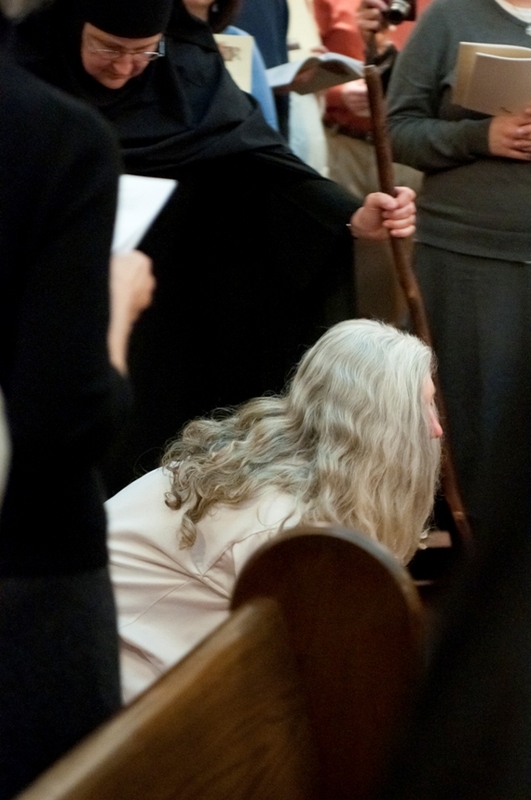 The entire Lenten journey was one of vigilance, patient waiting and expectation. With zeal, we tried to keep the oil lamps burning like the five wise virgins, when even in their sleep they kept vigil for the Bridegroom’s coming (Mt 25:1-13). Deep in our hearts we echoed the words: “I was sleeping, but my heart kept vigil” (Song of Songs 5:2). We waited patiently with confident expectation that God will fulfill our needs and deepest desires: “Indeed, while following the way of Your judgments, O Lord, We have waited for You eagerly; Your name, even Your memory, is the desire of our souls” (Isaiah 26:8). While the sinful woman was bringing myrrh, the disciple was conspiring with the lawless. She rejoiced to expend the costly myrrh, while he hastened to sell the Priceless One. She recognized the Master, the Master from whom he drew away; she was freed, but Judas became the enemy’s slave; how awful his callousness, how great her repentance. Grant us such repentance and save us, O Savior, who suffered for our sake. The harlot recognized you, the Virgin’s Son, as God. She wept for her lamentable deeds and begged you: Loose my debt as I un-loose my hair. Love me as I love You, though I deserve your hatred; and together with publicans I will acclaim You, Benefactor and Lover of mankind. “Loose my debt as I un-loose my hair.” Whoa. My heart leaped and ached at the same time. It was seeking repentance and I keenly realized when I sang that verse, that I was about to take the role of the repentant harlot seeking His love and forgiveness. I was going to literally “unloose my hair” before the Bridegroom for tonsure. My hair had grown long in the last couple of years. When I removed my scarf and pulled off the elastic, my hair fell onto my shoulders and into my face. 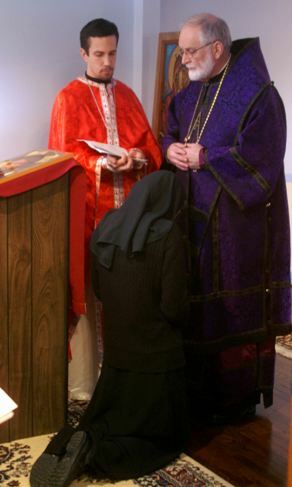 I felt an overwhelming sense of liberation and humility as I came forward and knelt before Bishop John. I heard Bishop John’s voice as he prayed, but did not comprehend the words; instead I found myself kneeling before the Lord. The tears of compunction that welled up in my eyes washed Jesus’ precious feet. His feet were anointed with the myrrh of desire to do only His will, then dried with my hair in love. I, like the harlot in Matthew’s gospel, was helping Him to prepare for His passion. The woman who had fallen into many sins, sensing your divinity, O Lord, assumed the myrrhbearers’ role and mourned, preparing you with myrrh before your burial. She said: Woe is me…Incline to the groaning of my heart as you bowed the heavens when you emptied Yourself. I will kiss Your immaculate feet and wipe them with the hair of my head, those feet whose steps Eve heard at dusk in Paradise and hid herself in fear. Who will search the multitude of my sins or plumb the depths of your judgments? Do not despise me, your servant, O Savior of my soul, for your mercy knows no measure. After the tonsure, Bishop John reached out his hand to help me up. As I took his hand and rose up I felt like I was being lifted up into new life. As I rose, I could not help but see Jesus’ loving gaze in Bishop John’s eyes and felt redeemed and at peace. After my tonsure, he blessed my habit and gave them to me. Before my tonsure, Bishop John prayed over Sister Julie, blessed her habit and gave it to her. Sr. Julie and I left the chapel to don our habits as everyone sang the Bridegroom Troparion. 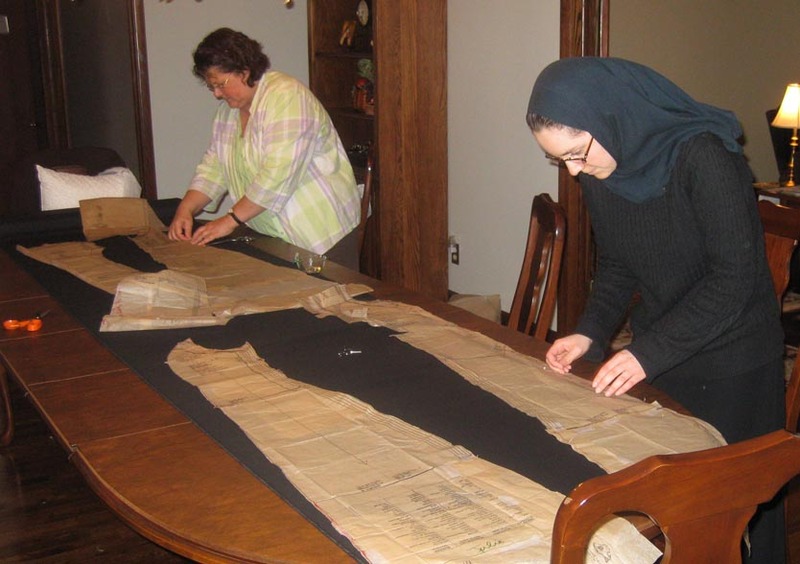 The nuns will wear a uniform habit, of the traditional eastern style. The habit is an exterior manifestation of an interior reality which humbly celebrates the fullness of monastic life. 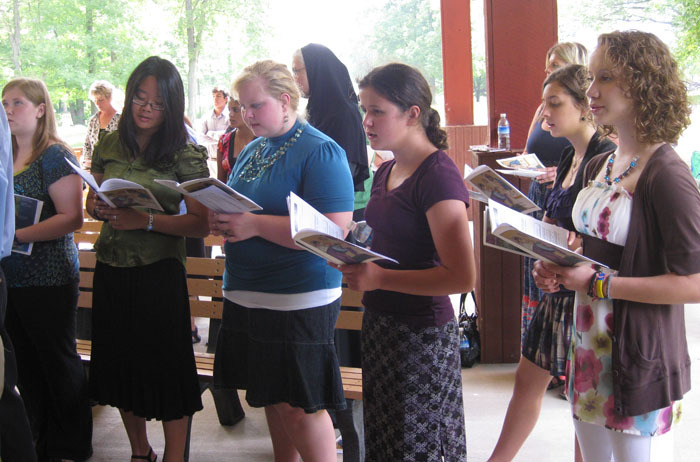 It invites others to enter the nun’s relationship with Jesus Christ. The habit contributes to the nun’s endeavor to live her vows: Poverty – The nun enjoys the simplicity of the habit which alleviates unnecessary concerns about what to wear or excessive possession of clothing (Mt 6:31). Chastity – The habit covers the body, revealing the sacredness and reverence of the body made in the image and likeness of God. Obedience – The habit is a constant reminder of a life of joyful repentance and dying to self, in passionate pursuit of union with Christ the bridegroom. After the Liturgy, we were overwhelmed with joy! I felt very giddy, intoxicated with joy and those present shared this joy with us. The celebration continued with a Lenten meal amid smiles, laughter and prayerful wishes. Though I shared the role of the repentant harlot preparing the Bridegroom for His passion with tears and myrrh, I anticipated the mixture of tears, myrrh and joy of the Resurrection that the Myrrhbeares would soon share with the world. Pious women ran in tears to You, O Christ, bringing myrrh to you as dead; but instead, they adored You in joy as the living God and announced Your mystical Passover to Your disciples. (Resurrection Matins Ode 7). As we continue to keep vigilance, patiently wait on the Lord and anticipate His grace, we pray for vulnerability to do His will and not to interfere with the guidance of the Holy Spirit by our particular demands or expectations of how it should or will be revealed. We pray for perseverance to be vulnerable to the Bridegroom’s desire for us and always be open to His gifts as we wait for His coming, keeping our oil lamps full and burning. 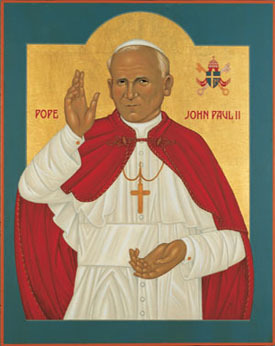 Blessed John Paul II, pray to God for us! It was a joyful day yesterday as we watched on television the beatification of Pope John Paul II, an extraordinary man we never met but one who we feel that we know and is interceding for us and for our monastery. As I looked over the headings for the outline of this apostolic letter, I realized that each of the topics we needed to address in our typicon would fit under the headings the pope used in his letter, such as "Between Word and Eucharist," "A clear look at self-discovery," "A person in relationship" and "An adoring silence." As I typed out each heading, the outline for our whole typicon came together easily! It is through Orientale Lumen and through our own personal prayer to Blessed John Paul II that we feel his intercession and support for us. And so we are bursting with joy at this big step in the Church's confirmation of his holiness! Although we only watched the recording of the beatification that my mom had taped for us, we were so excited for our soon-to-be-postulant, Jessie, who was THERE in St. Peter's Square!!! She seized this opportunity to take an exciting trip before she enters! She stayed up all night outside the square, with many other pilgrims, so that she could get inside the square in the morning for the beatification. This is the picture she emailed us from her cell phone. With 1.5 million pilgrims there, it is amazing that she got such a great spot to witness this historic event. Wow, what a crazy and awesome couple of weeks it has been! We could write numerous blog entries about it, (and maybe we will) but we have to start somewhere. On Palm Sunday weekend we hosted the eparchy's young adult retreat and welcomed into our home a wonderful group of joyful young adults. They all enjoyed learning more about discerning God's will for their lives during talks by young adult Cyril Pinchak, SJ, (from my home parish) a Jesuit scholastic. Bishop John celebrated the Divine Liturgy on Palm Sunday at the Shrine chapel across the street and joined us for a closing brunch. That evening, our friends Michelle and Chrysostom from Raleigh, North Carolina, drove in to stay with us for the beginning of Holy Week. 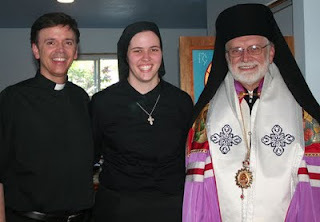 Our soon-to-be postulant, Jessie, was also able to stay with us all week. On Monday morning Bishop John celebrated Bridegroom Matins in our chapel, and a few parishoners from the Cleveland area joined us as well. We just love this service! (I wonder why...) Fr. Stephen Titko graciously made the trip out to the monastery from Parma multiple times during Holy Week to celebrate the Liturgy of the Presanctified Gifts, Bridegroom Matins and Matins on Great and Holy Friday with the twelve Gospel readings. It was such a gift to be able to pray many of the services in our own chapel. Great and Holy Wednesday was a big day for us! Bishop John celebrated the Liturgy of the Presanctified Gifts, during which I was received as a novice, Sr. Celeste was tonsured a Rasophore nun and we both received our new habits. Some family members and friends were able to join us, and the joy was just bursting! Sr. Celeste is working on a reflection about this experience to share with you. For me, it was an awesome experience to receive my habit. I truly feel embraced by Christ! On Great and Holy Thursday we attended vespers and the Divine Liturgy of St. Basil at the Cathedral in Parma, at which Bishop John washed the feet of twelve altar servers. On Great and Holy Friday we prayed Matins with the twelve Gospel readings, the Royal Hours and attended the vespers and burial service at St. Andrew parish in Mentor. On Saturday we prayed Jerusalem Matins, finished preparing our paschal foods, packed up the car, drove to the airport to pick up Rosalie--a friend from California staying with us for Pascha and Bright Week, got locked out of the car (oops...that was my fault! ), talked to some people in the parking lot as we waited to be rescued, managed to be only 15 minutes late to vespers and the Liturgy of St. Basil at Holy Spirit church in Parma, drove up to Holy Ghost church in Cleveland where we thought we would have an hour and a half of peace before Midnight to arrange our paschal foods in our basket and have some quiet, but instead found ourselves in the midst of frenzied last minute preparations and helped out as much as we could! Needless to say, after getting to bed at about 6:00 a.m., we slept in a little, and then got ready for a visit from Sr. Celeste's sister Charmaine and her family. We enjoyed the afternoon with them, complete with an impromptu Resurrection procession around the monastery with the kids, a delicious dinner and an egg hunt! After resting a little, we trekked back out to Cleveland for Agape Vespers (and some more eating!) at Holy Ghost church. It took a couple of days to recover, but Bright Week has been much more restful! We are so grateful to our Bridegroom for the joy He has given us as He has come forth from the tomb, raising us with Him! Thanks to Jessie's parents, we now have a video camera and captured many clips of action from Holy Week and Pascha. I am now attempting to edit them into a short video to share with you. Unfortunately our computer is a little slow for the editing program, but as long as I don't throw the computer out the window, hopefully we can share it with you soon! Christ is Risen!!! A beautiful YES to God! Happy Feast of the Annunciation! On this day that we celebrate the "yes" of the Mother of God to the reception of Divine Life within her, we are thrilled to announce another "yes" to God! 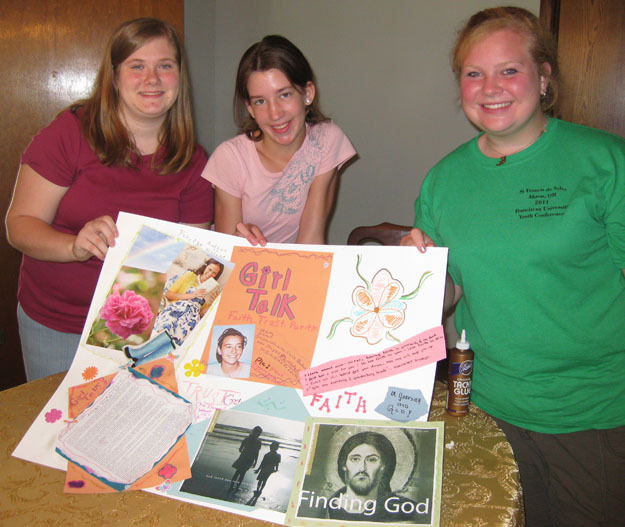 A young woman has said "yes" to the Bridegroom's invitation to life in our community! Jessie Houck will become a dokimos (postulant) with our community on May 22. Jessie is 24 years old and is the daughter of Rick Houck and Cathy McArdle of Manchester, Ohio. She is very active in various ministries at her home parish of St. Francis de Sales Roman Catholic Church in Akron, Ohio. Jessie received an accounting degree at The University of Akron in 2008. She has been an accountant for three years at BCG & Company, an accounting firm in Akron. From the beginning, Jessie has been a faithful cohort in our “Christ the Bridegroom adventure” and didn’t even allow a terrible blizzard to stop her from coming to help at our very first work day! 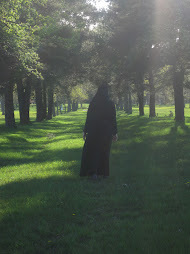 The dokimos (postulant) is one who seeks a trial period of living the monastic life. 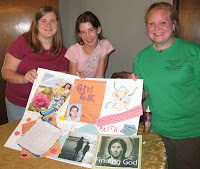 Jessie will begin to experience the daily life of prayer, poverty, chastity, obedience, hospitality and community life. Her attire will consist of simple black clothes, a black scarf and cross. Through regular prayer, silence and reflection, she will continue to discern Christ’s loving will in her life. Jessie is especially enthusiastic about her relationship with Christ and with those around her. She is very prayerful, thoughtful and playful. We thank and praise God for the gift she is. It is a courageous and awesome leap of faith. Please keep Jessie in your prayers as she continues to be drawn into the joy and mystery of the Bridegroom’s yearning. First Newsletter Coming Soon!...Can You Help? We hope that you had a blessed first week of the Great Fast. 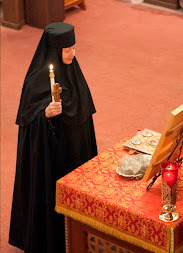 Ours was very prayerful, with some beautiful Liturgies of the Presanctified Gifts. If you are in the area, are you able to join us for our "mailing party" on Saturday, March 26? We need some help folding, stuffing, labeling and sealing the newsletter so that we can get it in the mail! We promise it will be fun! The day begins at 10 a.m., includes lunch, and ends at 3 p.m. (or before, if we finish sooner!) Please RSVP to christthebridegroom@gmail.com by Wednesday, March 23. 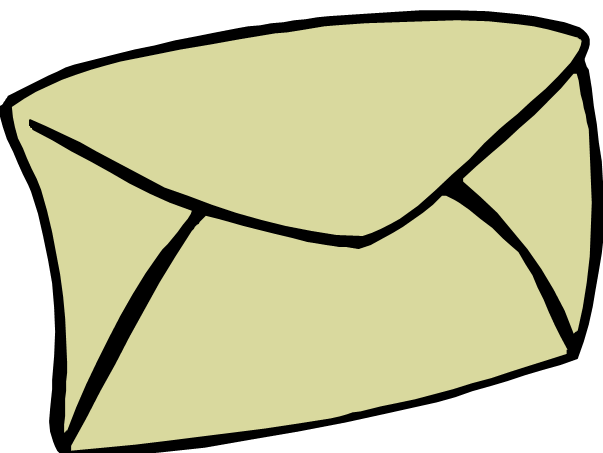 Would you like to be on our mailing list? If so, please send your mailing address to christthebridegroom@gmail.com by Wednesday, March 23. (Or after this date--we'll get you on the list before the next newsletter.) If you would prefer to receive the newsletter by email, you may indicate that. As we enter deeper into this Lenten desert, may we strive to continually empty ourselves in order to be filled to overflowing with the presence of God! Although the pre-Lenten period is nearly complete, and the Great Fast (Lent) begins on Monday, I can’t help but think about Zacchaeus, whose story we heard in the Gospel four weeks ago—the first liturgical sign that the Great Fast is approaching! We’ve heard the stories of the Publican and the Pharisee, the Prodigal Son and the Last Judgment these past few weeks, all preparing us for the state of mind and heart that we will need to begin the Lenten journey, but I have to say that of these pre-Lenten Sundays, Zacchaeus Sunday was the most profound for me this year (and I don’t think it was just because I have empathy for short people…). It seems that the story of Zacchaeus teaches us about ourselves and about Christ. There is a lot of humility happening in this story. Zacchaeus, a wealthy man, is willing to look foolish in order to see Christ, and Christ, the Son of God, is willing to endure skeptical murmuring by entering the house of a public sinner. Because of the humility of each in that moment, the two—God and Man—encountered one another, and salvation was the result. What a mystery it is that in the humbling of ourselves we become more like Christ! St. Gregory of Nazianzus said, “What greater destiny can befall man’s humility that he should be intermingled with God, and by this intermingling should be deified” (The Fourth Theological Oration: On the Son, 3). 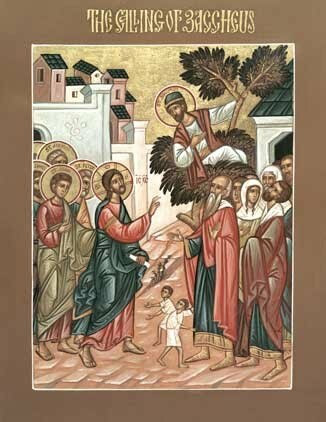 As the Great Fast begins, let’s enter it with the zeal of Zacchaeus. Let’s stretch ourselves to climb that tree. Jesus is coming to revisit Zacchaeus in us…if we let Him. He desires our conversion. He desires it so much that He’s willing to completely humble Himself to come into the house of our hearts. And then He himself will climb the tree—the tree of the cross.